Upon enrollment in a course at Virtual High School, students are assigned a certified, highly skilled teacher. A student has the same teacher throughout the course and can communicate with them via the VHS email system. The teacher is available to answer questions, provide feedback, and grade assessments. The student’s VHS teacher should be the first point of contact for any questions or concerns about the course or course content. Visit the Our Educators and Teacher Spotlight sections of the VHS website to learn more about our teachers. In addition to providing qualified teachers, each VHS course includes access to unlimited, on-demand, online tutoring at no additional cost. This service is provided by a renowned third-party tutoring company. The tutors are proficient in all subject areas offered by Virtual High School. VHS is pleased to offer this additional support to students who require additional help with their work. Students have access to tutoring via the learning environment. 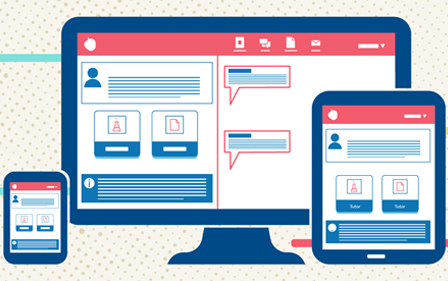 The chat-based tutoring service uses SMS texting and a web-based platform to reach students. The service is unlimited, on-demand, and available 24/7 for most subject areas. * When a student needs assistance, they simply type a question in the chat box, upload a file or image of the assignment, or use the whiteboard to communicate. A tutor then helps the student by facilitating learning rather that merely providing the student with answers. All sessions are saved on the student's personal dashboard and monitored by the teacher and VHS Administration. Students will not be permitted to utilize the tutoring service during their final exams. *On rare occasions, response time may be delayed for subject areas that have lower demand.